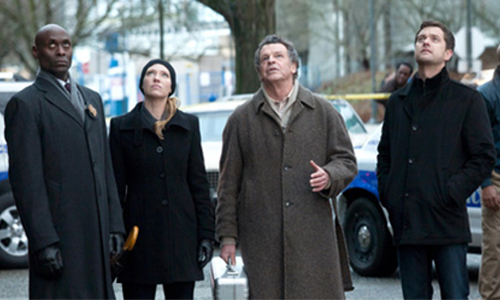 Cultural Wormhole: Fringe - "Os"
Lance Reddick, Anna Torv, John Noble, and Joshua Jackson looking to see if those Friday ratings are going up. "Os" flows pretty nicely out of the events and thoughts of "6B", but both episodes were separated by a trip back to '80s 'Fringe' and a week off due the NAACP awards. As much as I enjoyed "Subject 13" did interrupt the flow of the show's regular narrative. That being said, this was probably one of the strongest episodes of this season's middle chapter. And like "The Firefly" which kicked off the second arc of season three, "Os" includes a guest appearance by a great '80s icon. Okay, Alan Ruck may not be a household name, but who didn't love him in Ferris Bueller's Day Off? Hell, I even dressed up like Cameron Frye for a '80s themed party a few years back (those leather suspenders were a pain to find). Since then, Ruck has been a regular on 'Spin City' during the late '90s and has made numerous guest appearances in movies and on television. Last year, he had a fantastic turn as a money launderer turned dentist on 'Justified'. As with most jobs he is given, he does a great job on last night's 'Fringe'. There a quite a few parallels between Ruck's character, a scientist driven to find a way to help his son, by any means necessary, and Walter Bishop. Fortunately, the writers saw fit not to beat it into the ground when Walter spoke with him at the jail cell. What did transpire was further indication that the laws of physics are breaking down due to Walter's initial invasion of other universe. Walter's manic desire to repair the damage done has led him to try to contact William Bell from beyond the grave (as well as smoke some weed with a Massive Dynamics security guard played by Jorge Reyes aka Hurley from 'Lost'). Nina had received the bell during the reading of William's will at the beginning of the season, and it was immediately recognizable as the one (or at least of copy) that Bell rang in Olivia's presence before literally hurtling her back to Fringe Prime, way back at the very beginning of season two. The pay off was pretty great. William Bell is now inhabitting Olivia Dunham's body (sorry Peter). If the creators of 'Fringe' are as smart as I think they are, they will certainly have fun with this idea. It's so ridiculous, that to play it too straight would be make it seem even more absurd and stupid. Hopefully, we'll get some akwardness between Willivia and Peter and some fun interaction between Willivia and Walter. Unfortunately, this event comes just as Peter confides in Olivia about his hunting down of the shapeshifters in "Reciprocity". You knew things could go to smoothly for those two kids. He admits to gunning down alien cyborgs; she gets possessed by Spock. Never a day at the park for the Fringe crew. For the most part, "Os" continues the third season's strong direction of melding standalone one episode plots with huge amount of forward momentum for the overall show mythology. Plus, we continue to see some great character moments for the principle cast as Olivia, Peter, and Walter struggle to deal with the chaos swirling around them. This certainly felt like the end of the middle chapter and I'm really looking forward to final third of the season.